In the camp there was a cage with a bear and an eagle. Every day, they would throw a Jew in there. The bear would tear him apart and the eagle would pick at his bones. 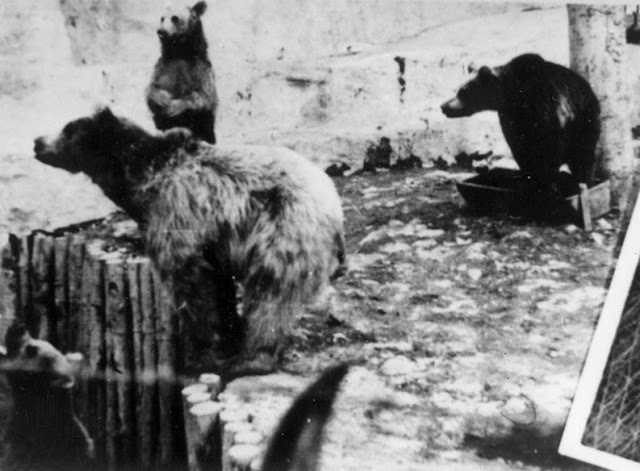 The photo below shows the camp zoo where bears and other animals were kept. On the left side of the photo is one of the guard towers of the camp. The zoo was located just outside the camp and within view of the prisoners." Article 21. The Tribunal shall not require proof of facts of common knowledge but shall take judicial notice thereof. "In the camp there was a cage with a bear and an eagle. Every day, they would throw a Jew in there. The bear would tear him apart and the eagle would pick at his bones"
Gee, Mr. Hubert.....I wonder why the Bear didn't eat the Eagle?.....Oh, now I remember!.....Mother Nature isn't allowed in Holohoax fantasies! "It is unbelievable, but it happened". Does it sound familiar? mincou.....do you realize that in a sane world, these people would be in mental institutions? Treblinka's bears (so says the Yad Vashem at least), but looks like the Buchenwald bear pit to me. The inmates were also forced to build the zoological garden, which contained monkeys, bears, and even a rhinoceros.